Celebrities around the World have taken to their respective social media accounts to mourn Grammy-nominated rapper, Nipsey Hussle, who was shot and killed on Sunday evening. The 33- year-old father of two was shot alongside two other victims outside of his store called The Marathon Clothing in South Los Angeles. He was pronounced dead on arrival at a hospital while the two other victims remain in serious condition. 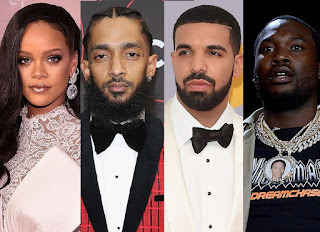 In response to news of his shocking death, Nipsey Hussle’s fans including his celebrities friends like, Rihanna, Drake, J.Cole, Meek Mill, Lebron James, Snoop Dogg, Chance The Rapper, Pharrell Williams, 21 Savage, Gucci Mane, SZA, Micheal Jordan among many others have taken to social media to pay tribute to him.